There are many kinds of clay, like earthenware, stoneware, and the most beautiful, porcelain. Porcelain is glassy and non-absorbent when fired to maturity. We use mostly porcelain clay, made from grolleg, imported from England. We fire to cone 11, which is about 2400 degrees Fahrenheit. Our pottery is as durable as restaurant ware! Porcelain is white in color. It is the most expensive clay. When glazed with a translucent or clear glaze, the whiteness of the clay makes the glaze appear brighter than it would on stoneware. Stoneware has iron in it that produces speckles and causes the glaze to darken and get muddy in color. Porcelain gives glazes a smooth, clean, brilliant glaze surface. Clay is found in sedimentary deposits and soil. There are many types of clay. Different clays have different physical and chemical properties. 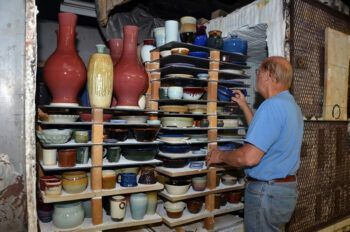 The properties potters are concerned with are color, shrinkage, plasticity, and maturation temperature. Porcelain matures at cone 9 to 12. Red earthenware clay matures at much lower temperatures of cone 1 to 4. Earthenware is porous when fired to maturity and gets its warm terracotta color from lots of iron in the clay. Stoneware clay is quite plastic, has less iron than earthenware clay, and matures at temperatures of cone 7-10. It has little porosity and fires to a warm tan or brown color. It can be a good throwing body straight out of the ground. Porcelain is white because it has almost no iron it in. It matures at cone 9-12. It is not very plastic by itself and requires the addition of ball clay or some other plasticizer to be a good throwing body. It also requires the addition of about 25% flint and 25% feldspar make it mature at cone 10 or 11 and to make glazes fit well. There are many other types of clay. Most clay bodies potters work with are actually blends of various clays, feldspars and flint. There is much to learn about digging clay, and formulating clay bodies. Clays are formulated to have the desired color, firing temperature, plasticity, shrinkage and porosity the potter requires for the type of work s/he wants to produce.